Irrespective of being a stay at home mother, a college going or a lady working professionally in an organisation, every woman has to apply makeup then and there, either daily or on different occasions. However, there are a few misconceptions about applying makeup. You might have seen people who assume that cosmetics are made for less attractive faces and those who wear glasses should not use makeup, especially eye makeup. Probably you wear spectacles like me and assuming the same about yourself then you are entirely wrong. Cosmetics are made for everyone, whether you have fair skin, dark complexion, medium tone or you use glasses or not. All you need to do is to pick the right shade of cosmetic item you are using on your face. Whether, you choose a suitable shade for the base or concealer or it is the shade selection for shadows and lipstick, a wide range of hues from dark, medium and light is available for you to choose. Once you have selected the right shade, the next step is to apply it sensibly without overdoing your face. As you wear specs, using cosmetic becomes extremely critical. This is because you not only have to consider your skin tone and features, but you also have to think about your spectacles shape and colour. 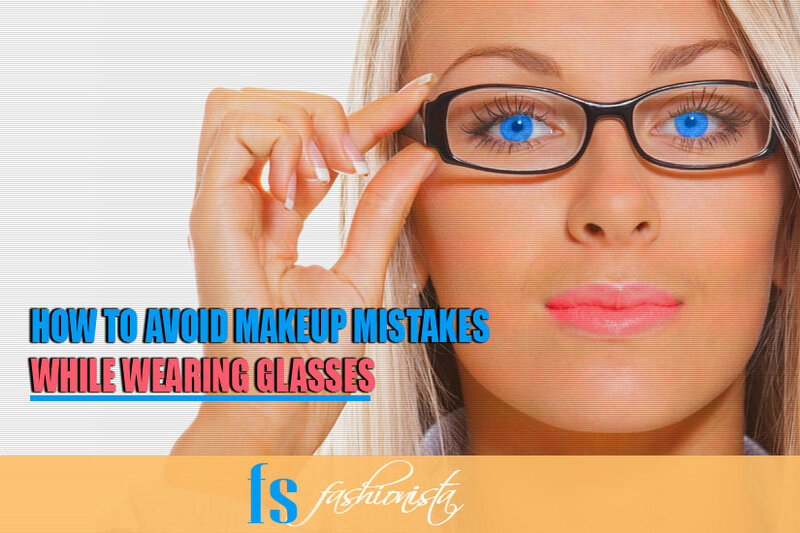 Below I am sharing the lists of worst makeover mistakes you should avoid to look gorgeous wearing makeup with glasses. We all love Smokey look, as it seems incredibly dramatic all the time. I suggest you stay away with this while putting an eyewear on your face. Try using pastel shades and limit yourself to one colour only. Alternatively, if you are the fan of blending colour use a medium colour to cease the primary hue. Don’t forget to blend it well, if you really want to add some drama and dimension. After picking up the right colours for eye shade, next is to select the suitable liner and mascara. Never match the shade of liner with your frame colour. Choose a lighter shade if you really want to make them noticeable. Also, don’t forget to curl the lashes to enhance its length. Always use a waterproof liner to avoid smudging the lenses of your specs. Skip mascara on lower lash. Don’t darken lower lashes, as it can create an unwanted haze that gives you a tiring look. Concealer is a major component of makeup that you cannot ignore. Focus on using yellow tones, as it will help you not only to hide existing dark circles if you already have, but it also keep this area brighter. To add a glowing touch use a tiny amount of shimmery highlighter on the lower area of the lower lid. Eyebrows should not be ignored. Don’t forget to tweeze them regularly for a cleaner and better look. Don’t forget to brush them in the upward direction after applying all the makeup not only to make them smooth and even, but also to remove any residues of powder. Fill in the gaps with the eye pencil that matches your hair colour to give them a defined and uniform look. A mild stroke of blush on is necessary to keep your face glowing and fresh. If you are thinking to skip it, as you are wearing power glasses or sunglasses, it is still necessary to develop the same fresh look. Lipstick is another dominating component of the overall makeover. Its colour should be chosen carefully according to the type of makeup. Besides this, you should also consider your skin tone, frame colour lips type and time of the day when you are using it. Disclaimer: This sponsored post is powered by Rivoli group, a leading name that produces sunglasses in Dubai with premium quality and a diverse, stylish range.